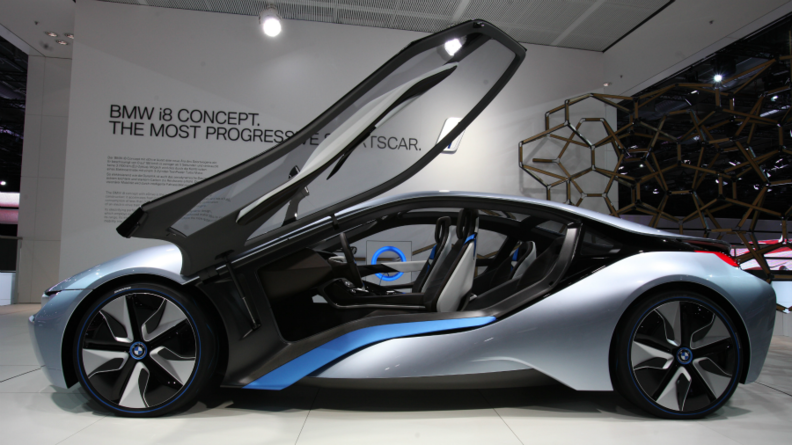 The sporty i8 hybrid concept, shown at the Frankfurt auto show, has a top speed of 250 km/h (155 mph). LONDON -- BMW says it is sticking to plans to sell the i8 hybrid supercar for more than 100,000 euros ($125,400) when the model reaches customers in about two years. The premium German automaker will price the smaller i3 electric compact car, the first model from its i sub-brand to go on sale next year, "very competitively for the substance you get" from new powering technology, Ian Robertson, BMW's global sales chief, said Wednesday at the unveiling of the sub-brand's first global sales outlet in London. The showroom "is a further demonstration of our commitment to electro-mobility," Robertson said. The German company is spending 530 million euros developing the sub-brand to keep its sales lead over rivals Audi and Mercedes-Benz. BMW is currently the best-selling premium brand worldwide with global sales of 1.38 million cars and SUVs last year. Audi sold 1.3 million, while the Mercedes-Benz brand sold 1.26 million in the same period. In April, BMW released pictures of the i8 Spyder, a roadster version of the i8 coupe, the third concept in the automaker's sub-brand line-up. The production model of the i3 compact is based 85 percent to 90 percent on the car's concept version, Benoit Jacob, chief designer for the i models, said at Wednesday's unveiling. BMW says it is considering offering i cars through a mobile sales force, which would operate in locations with no dealers, and over the internet. The automaker has already used mobile teams to offer test drives at holiday resorts, said Linda Croissant, a BMW spokeswoman. At the same time, "the dealer will remain the backbone of what we are doing in the interface with the customer," Robertson added. In BMW's homeland, Germany, 45 of BMW's roughly 200 dealerships will sell i models, Robertson said. To protect the sales outlets from the risk of dealing with new-technology cars, BMW will continue to own the vehicles, and the 45 i-brand showrooms will operate as agents rather than dealers, Karsten Engel, BMW's head of sales in Germany, said earlier this month.